I am still trying to be a tidier and organised Carp angler, it is a long and slow process, but I am trying. These 2 pieces of equipment from Korda are helping me to achieve this. 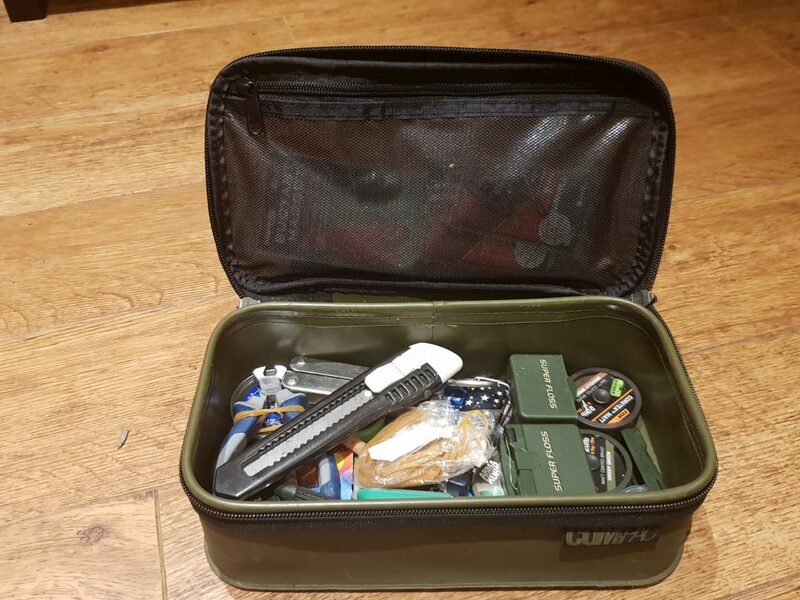 I used to carry with me a large Wychwood tackle box that was filled to the brim and took up a lot of room. I must admit that a lot of the stuff I had in it was not necessary and never got used. So, the switch to the tackle safe and 140 pouch forced me to re-evaluate what I really need to take with me. If I am being honest I probably still have a few items that are surplus to requirements, but it is getting better. 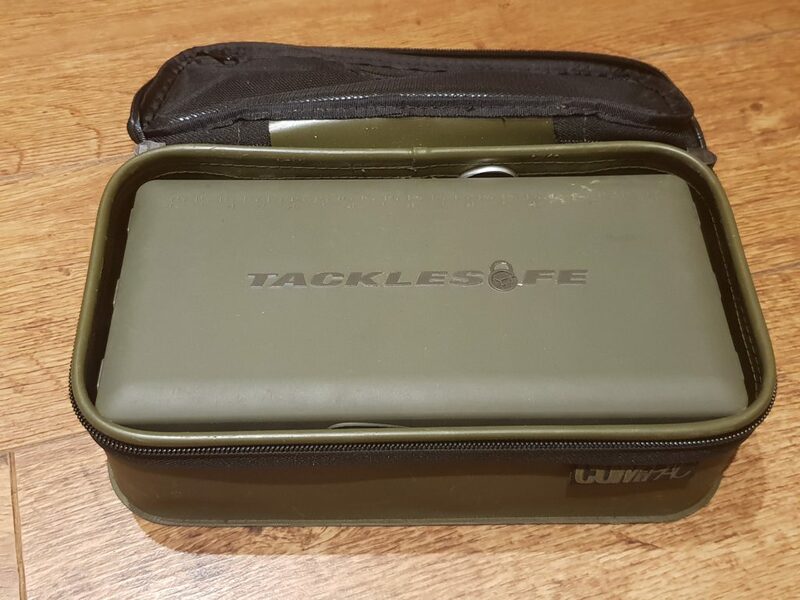 The tackle safe is a clamshell design (It reminds me of a little tackle box that I got free with Anglers Mail many moons ago but about five times bigger) and is secured magnetically. Inside there is a plethora of lidded compartments for all your rig bits, clips, beads and the such like. There is also a large open section that I use for baiting needles, scissors, etc. On the lid of the tackle safe there is a handy 8-inch measure. There are 4 sizes available in the Korda compact EVA luggage range. The great thing about the 140 version is that the Tackle safe fits snuggly in it and does not rattle around. The pouch is made of a strong durable material that is water proof and has welded seams. I use the pouch for storing spools of hook length materials, tools (scissors, forceps, multi-tool, needles, etc) finger stall and other large items. In the zipped compartment in the lid I keep all my hooks. I am really impressed with both items and at last I have a tackle box, or better described as tackle solution, that is neat and tidy. Time will tell if it stays this way! 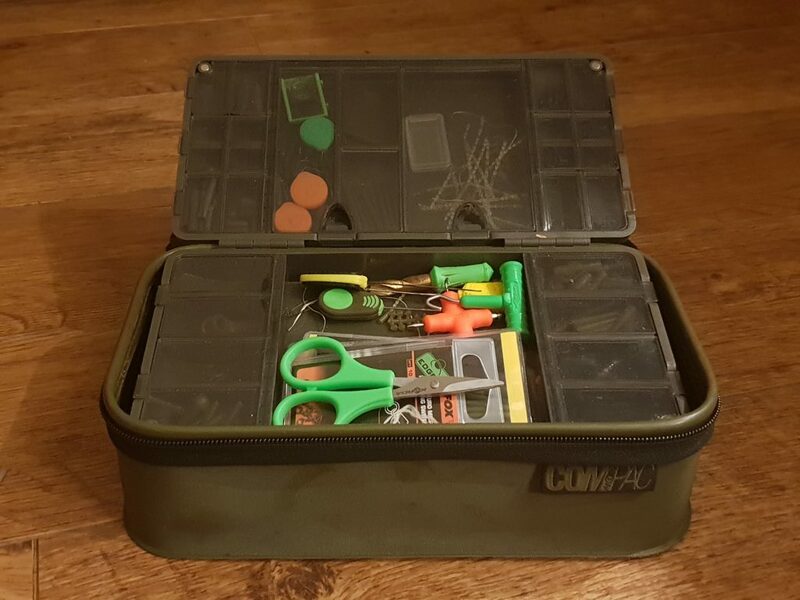 This entry was posted in carp, Review, tackle and tagged carp, carp tackle, Fishing Tackle, Korda, Review, tackle.